DC vs RPZ - What's the Difference and Why Should You Care? You’ve heard these phrases and acronyms repeatedly. If you are a designer, you feel sure that you are expected to know what they mean. Here’s a quick rundown on what they are and how they differ. A designer may specify one of 2 types of backflow prevention devices. First, the Double-Check Valve Assembly. This is often shortened to DC and is typically thought of as the appropriate solution for low hazard conditions. Second, the Reduced Pressure Zone Valve Assembly, often shortened to RP or RPZ, is thought of as the appropriate solution for high hazard conditions. How do you determine hazard? The simple answer is that the purveyor determines it, but every jurisdiction is different. Every city has its own list of named examples for what constitutes the hazard threshold. Here is an example from Washington DC. They also stipulate that if the anticipated use, as you know it, is not named explicitly, then they reserve the right to make the decision during plans review. It’s also important to understand that you cannot, as a designer, over-protect the incoming water service. This means there is no penalty for providing the higher degree of protection. The Double-Check Assembly (Figure 1) was developed in the 1950s for the fire industry. Any time the pressure on the property (downstream) side exceeds the pressure on the city (public) side, the two redundant check valves close stopping the backwards water flow. There are two problems with the Double-Check backflow preventer. First, no remedy exists in the event of a malfunction of the valve closures or if debris in the water line causes the valves to not close completely. Second, and this is the big problem, there is no way to know when such a failure has occurred without conducting a full test by a qualified professional. The Double-Check is a closed system. It has no method of revealing whether the internal check valves are functioning properly and no way to detect the presence of debris that is impeding full closure. 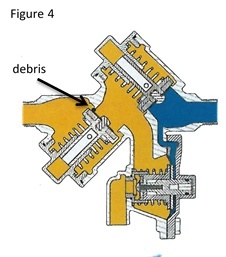 The Reduced Pressure Zone Valve Assembly (Figure 2) consists of two independently operating check valves just like the Double-Check as well as a hydraulically operated differential relief valve located below the first check valve. This hydraulic valve and its placement makes the RPZ virtually fail-safe but it comes at a cost to the area around the device. When a flow stop occurs, both check valves close. At that moment, the relief valve opens and evacuates the water between the valves. 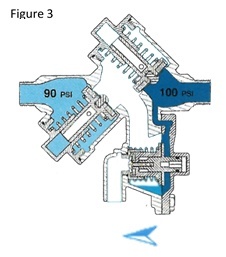 (Figure 3) Some think that this event defines the limit of how much water can ever flow from the RPZ into a drain. This is not so. 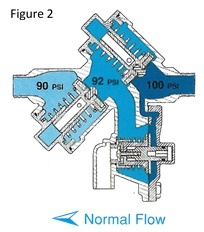 Consider a flow-stop situation, like one that might naturally occur at the end of the day (Figure 4). If you look closely, you can see that a small pebble has lodged in the #2 check valve. Now imagine some sort of back siphon event over night. Perhaps a nearby building fire leaches the water back with the draw of a fire hydrant; or a pump station fails; or a water main breaks. Because the #2 check valve is not closing, all the water that has been delivered to the building will continue to flow out the relief valve until the private lines are cleared. If this is a four story building, that’s a lot of water. Watch the video below for an example of RPZ flooding and to see just how much water is discharged when a small amount of debris becomes lodged in the device. Now consider a full failure of the #2 check valve, like one that might occur if the device is knocked out of round or has a mechanical failure. It’s essentially the same event with the exception that due to the larger valve opening, there is actually a higher flood rate. Now you have water flowing through the relief valve at full head pressure. Again, if this is a large or multi-story building, that’s a lot of water very fast. 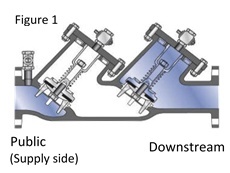 The main thing to take away from this is that both backflow prevention device types perform the same function when they are operating properly, but only the RPZ is designed to protect the public water supply by disposing of any backwards-flowing water if any of the check valves or the relief valve fails.